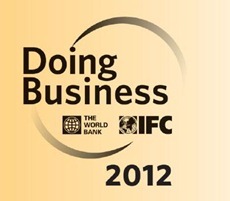 India ranks 132 on 'Doing Business Index’, gains 7 places! The economic health of any country is hugely dependent on the ease of starting / doing a business in it. In other words, countries which offer a conducive environment for business end up attracting more businesses resulting in a flourishing economy. DoingBusiness has been publishing its ‘Doing Business’ index for a few years now and the report serves the exact same purpose – How business friendly a country is! It is one of the most exhaustive report with 183 countries and uses a large number of factors to rate a country’s potential to attract and retain businesses. Based on the latest Doing Business report, India’s ranking has improved by 7 places to 132 from the earlier 139. They say "Devil is in the details"! It comes out in full-light when you see India fare on various factors that comprise the overall doing business rank. 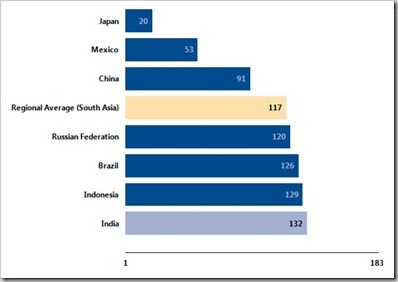 Indian ranks fairly well for access to capital and such as evident from Getting Credit (40), Protecting Investors (46). This suggests that the overall policies governing access to capital and other regulatory policies are favorable. This I found really surprising. Even as the time to export documents has decreased by a day as compared to last year, the cost to export as well as import documents has increased. Overall, there are definite signs of improvement when it comes to Doing Business in India but I personally think that the policy side of things needs to improve drastically. Things like days to register a business and getting construction contracts should definitely improve if the country needs to grow its economy. After all, the earlier a business starts the earlier it can start generating revenue and employment among other things. What are your thoughts on India’s marginal improvement in the Doing Business Rank? Also, do you think the ground reality is any different than what the report suggests? 5 cool techie gifts for this festive season! Ankit !! The following is just trying to be funny. May be a little bit sarcastic. Dont take it seriously. Ask Mittal : He will probably rate India as the last country in the list :) He is still trying to realize his 12 million MTPA steel plant in Orissa and Jharkhand after 6 years.